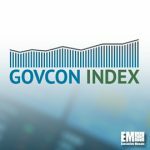 Executive Mosaic’s GovCon Index traded in tight range Monday to record its third straight monthly decline with a second week of quarterly financial reports from GCI companies set to begin Tuesday morning. U.S. stocks also struggled for direction Monday in the start of the final full trading week before the presidential election Nov. 8 and traded gains and losses as investors watched for new developments in the widely-reported new inquiry over emails related to Hillary Clinton. Monday’s close puts the GovCon Index at a year-to-date gain of 4.85 percent versus the S&P 500’s respective climb of 4.02 percent over nine months, while the latter U.S. stock bellwether has posted declines in three consecutive months. This week continues quarterly earnings season for GovCon Index companies with several mid-tier prime and services-oriented contractors lined up to state results. GovCon Index gainers and laggers split roughly even in Monday trade and four of its 11 S&P 500 companies advanced with McKesson Corp. (NYSE: MCK) the GCI’s best net performer a session after its large Friday decline on lower full-year guidance. Shipbuilder Huntington Ingalls Industries (NYSE: HII) and Rockwell Collins (NYSE: COL) respectively ended second and third, while co-listed defense primes L-3 Communications (NYSE: LLL) and Lockheed Martin (NYSE: LMT) lagged. Rockwell Collins ended 14 cents shy of Oct. 21 closing price of $84.46, its last since the announcement of its B/E Aerospace (Nasdaq: BEAV) acquisition two days later. Shares in L-3 have traded down 7.91 percent since the company’s 2017 guidance came in below analyst expectations Thursday and Huntington Ingalls reports third quarter results Thursday. On a monthly basis, eight GovCon Index companies moved forward and five co-listed stocks gained with Boeing (NYSE: BA) the best percentage performer for the GCI overall and Northrop Grumman (NYSE: NOC) second after both companies posted third quarter earnings above Wall Street’s forecasts. McKesson, Cubic Corp. (NYSE: CUB) and Engility were the GCI’s three worst percentage movers for the month.